I would also like to request this feature. Im trying to move to Affinity from Adobe's crazy monthly fees and a DDS plugin would go a long way. Yes i also would like to request this feature! Its absolutely needed for my workflows. At least the possibility to use the old NVidia DDS Tools well the exporter would be VERY HANDY! I also try to get my Company to switch over to Affinity, this would improve and simplify our workflows. Its not only about the "license" model its mainly because of the way more stable tool, the performance and overall look and feel! +1 For me as well. DDS editing would be amazing for game modding! Adding my +1 for DDS support. Have had to drop PS for financial reasons, grabbed Affinity Photo and Designer as long term alternatives and have been heavily disappointed to find no support for this format. Intel Texture Works is the most recent advancement to the various DDS formats, now supporting DX11+, and has a few new texture formats which are now being used by games. The most desirable being BC7 Linear Fine with MipMap generation. We can now have normal (bump) maps where the detail counts (without artifacting) and have them compressed. It would be very nice if Affinity Photo could support the plugin (its an .8BI plugin and a cubemap script), currently only Adobe Photoshop can use the plugin, so anyone wishing to seriously take part in developing textures for games like Skyrim Special Edition or Fallout 4 need Adobe Photoshop .. Otherwise they cannot produce the correct texture formats for overall optimised performance without losing a lot of detail after compression. No doubt the next generation of games will also be utilizing those newer formats listed on the Intel Texture Works page. The NVidia plugin does not support the newer formats, and the GIMP DDS and Normal plugins I believe are no longer being developed, Intel Texture Works plugin is the way forward which supports all of the older formats aswell. I've added DDS support to a list of things to look at in the future. This could be a long way off though, as I have a lot of higher priority work to complete first. Thank you for considering it Mark, it would certainly add to the features making Affinity more desirable than Photoshop and its damned subscription idea. Mark, I'm trialing Affinity Photo and would also like to request dds file support. I currently use GIMP which supports it but would much rather switch to Affintiy which is much more user friendly for those familiar with Photoshop. DDS is the main format in textures for FSW, P3D, FSX, etc. (Flight simulators) and I would love to be able to use Affinity for creating them. +1 for DDS!! The most needed in my case. Demo is great! I would definitely buy this if dds export is available. I have purchased the software in the hope that DDS will eventually be a native format. schade das es kein dt. Forum gibt . Nun zu meiner Bitte , wann kommt die dds einbindung in das Programm ? Ich muss die psd-Datei immer mit gimp umwandeln in eine dds-Datei. Another customer of the Affinity products on multiple platforms and head of a game development studio. We would love to have native DDS support in all of your products (both for the Intel and Nvidia ones). @Mark Ingram can you give us any form of insight or update on where this feature request currently is on your (no doubt long) TODO list? Another customer of the Affinity products on multiple platforms and head of a game development studio. We would love to have native DDS support in all of your products (both﻿ for the Intel and Nvidia ones). @Mark Ingram can you give us any form of insight or update on where this feature request currently is on y﻿our (no doubt long) TODO list? Still a way off unfortunately, I'm working on improving performance right now, rather than extending our file support. What is your current solution for DDS? 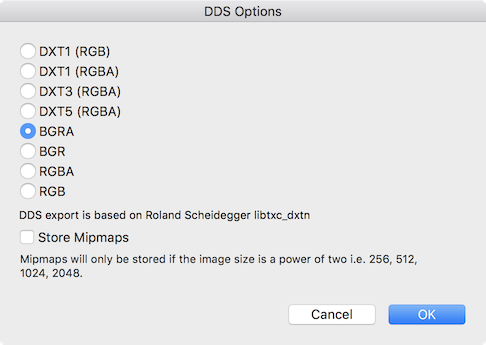 Export image and convert to DDS? Posted workflow in https://forum.affinity.serif.com/index.php?/topic/34306-dds-file-support/&do=findComment&comment=273904. Exporting to png and converting with Graphic Converter where Torsten (the dev) added support for DDS about a week. He uses Roland Scheideggers libtxc_dxtn for exporting which to me could be a simple(?) solution. That is indeed our solution, to export to PNG and use external tools (ImageMagick) to do the actual conversion. We also still have a few people on the team that are still using Photoshop as they don't like these extra steps during their design process. Thanks however for your honest answer, as a fellow software developer I know all about priorities and balancing long wish lists. I would like see the DDS support also. In my case, I export TARGA files from Substance Painter (I need RGB+A support for textures), and use another utility to convert to DDS. I bought Affinity Photo to create bits and pieces to use in Substance Painter, but it would be great if AP would support import/export of DDS. I would also really like to see DDS export. It's really cumbersome to have to go through multiple apps just to get this done every time you need to see a change. Also Batch job - Save as DDS would be great plus.